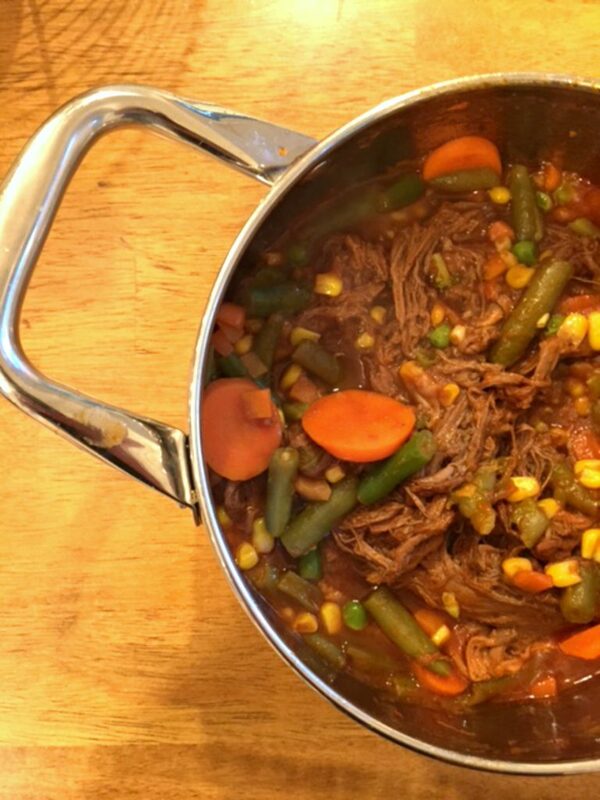 This easy pot roast recipe is hearty and filling with lots of great textures and flavors. Adding the balsamic vinegar really makes for a wonderful depth of flavor. I originally was going to use only water or beef stock. Then, while staring into the pantry and thinking about what to put into the roast I saw the balsamic vinegar which I had just purchased up in Rhode Island when visiting family. There’s this great oil and vinegar shop in Providence that sells samples of all different kinds of oils and vinegars. I decided to use the sample bottle of the plain balsamic. After the roast was done, I was so glad it was added to the roast. 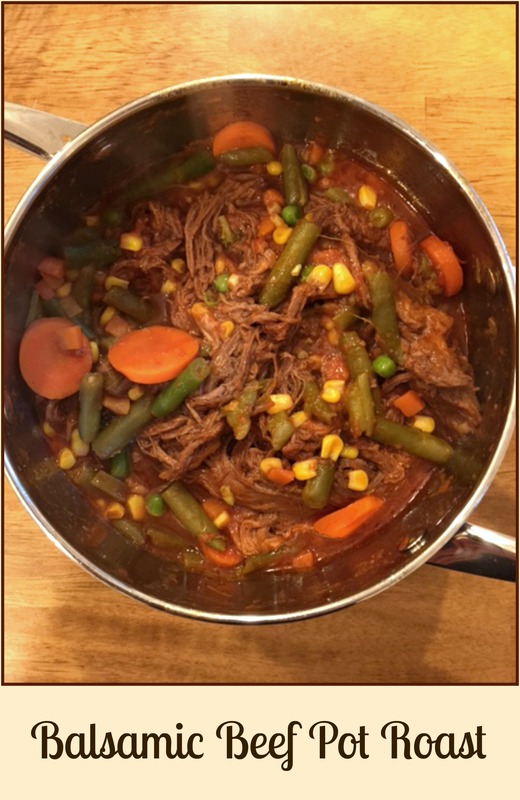 A perfectly pop of flavor and different than any other pot roast or brisket I had tasted before. 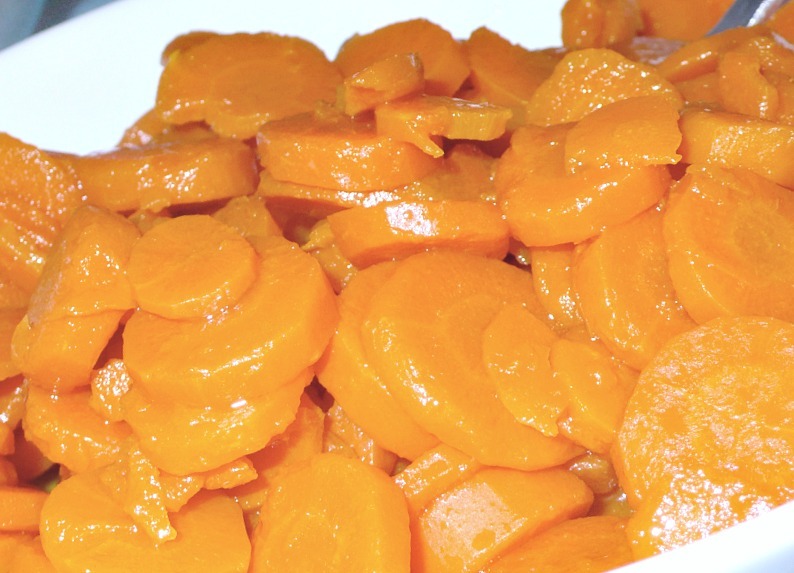 My family loved this recipe and now it’s going to be included on our holiday table. I decided to shred the beef at the end. You don’t have to. You can slice the roast. My family really liked it this way. I served it over egg noodles. Next time over rice. (My sons suggestion). Anyway is the right way. It’s a no fail, forgiving kind of recipe. Add in any type of veggie you like. The sky’s the limit. One more thing…Don’t forget a nice crusty bread to sop up the wonderful gravy. YUM! One boneless chuck roast, approximately 3 lbs. 1 tbsp corn starch with 1/4 cup beef broth to make a slurry if needed at the end of cooking. This is optional. Only if you want the sauce to be thicker like gravy. Season the roast with salt, pepper, and garlic powder on both sides. In a large heavy bottomed pan sear both sides of the roast until browned. Deglaze the pan with 1/2 cup of the beef broth and balsamic vinegar. Cook for about 1 to 2 minutes. Add the water, the rest of the broth and onion to the pan. Bring to a boil. Cover and simmer on low for 3 to 4 hours. Check every so often. Add in frozen veggies after 2 hours or so. Carefully remove the meat from pan to a large bowl. The meat should be nice and tender so you can start to shred or slice. Place back in the pot and gently stir into sauce. This will be the time to add in the slurry if using. Bring back to a boil to thicken sauce. Gently cook for a minute or two. Turn off and let sit in the pot for at least 10 minutes.